Mr. Peanut has received a makeover and as usual he is not wearing pants. The gave him a snazzy, upper-class twit-style waistcoat, but his lower half is still au natural. I realize that there is a rich history of pantsless anthropomorphic cartoon characters- Donald Duck, Porky Pig, Bill Clinton- but what makes Mr. Peanut stand out is that he is skirting the issue (so to speak) by wearing some sort of leg warmers. They look like pants legs but do not cover his crotch. Why must he walk around with his nut hanging out? He is still instantly recognizable with his lower shell discretely covered. I say it is time to strike a blow for morals and decency. 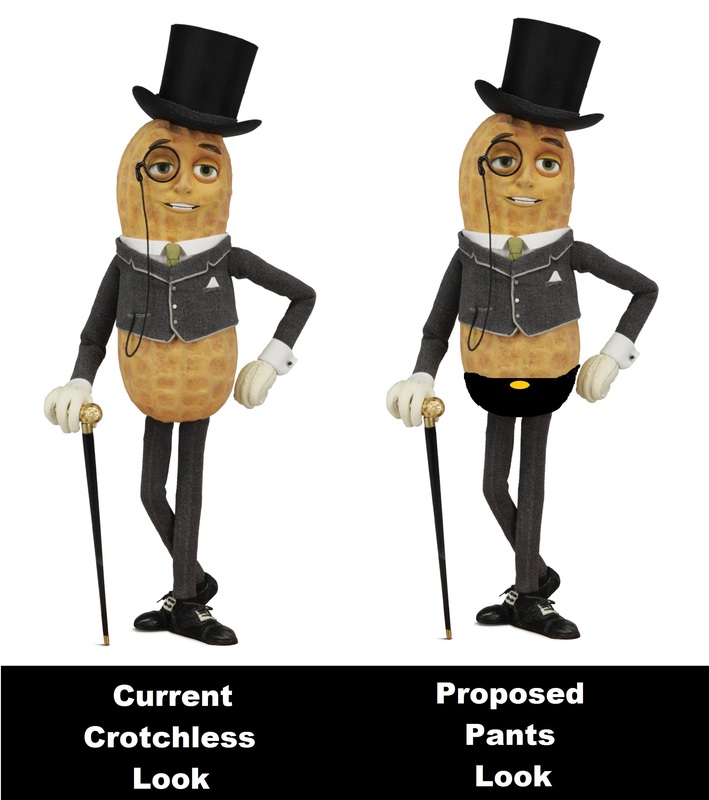 Join me in my crusade to put a pair of pants on Mr. Peanut. ← March Madness 2: Electric Boogaloo! Shouldn’t the waistline be a little higher? I originally had it up to the waistcoat, but it made him look high-waisted. Plus this looks funnier. You might have invented a new hipster trend!